Voetball...Bolspiel...Futebol...Football is music, is life. Last night's Galaxy v. Real Madrid match at the Home Depot Center was another glaring example of "The Soccer Gap." Real Madrid, who won 2-nil, are about the classiest group of players anywhere assembled in the world (except perhaps Liverpool or Barcelona), so they can make a good team look like The Bakers' Guild of Devonshire...on their best day. Galacticos were just that. And the Galaxy were wandering out of orbit. "Danger Will Robinson!" Zizu is the Jedi Master and everyone else in a white shirt is influenced by his uncanny first touch, firm delivery to feet or to space -- never a question which one -- and Madrid play with a confidence, tempo and sense of objective like no team in any league. First off, it's clear why Beckham gets criticised as being "past it:" compared to Zizu, who makes it all look effortless, he looks like a call-up from the Salamanca Reserves. However, Becks' work-rate never flags and he doesn't tend to give the ball away easily or when he's not taking a calculated risk. Michael Owen is a charm. He deserves to start with such consistent quality, although it is likely that his scoring rate as a substitute last season was abetted by the advantage the speedy one takes in coming on late, against tired legs. This alone, is why I'll be surprised to see him leave if he is consistently used late in every match. It's possible the constant rumours of his dis-ease at Real Madrid are constructed as a red herring to mask this effective tactic. My favorite Galactico -- a testament to Globalization -- is a Dane who moved to Madrid this year from Everton. It is Thomas Gravesen. He plays the Roy Keane/Claude Makalele position like Thomas Gravesen. Everything starts through Gravesen. He is tough, takes no guff and looks a freight in a smooth pate. 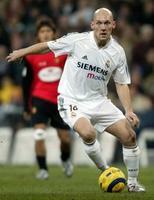 Gravesen is a key for the Real build up. And ever so steady. Roberto Carlos is about the worst defender to ever be voted best left back in all of football. The product of his Left Foot, however, usually registers on the scoreboard. I'll keep RC. Zinedine Zidane is simply still the best footballer on Planet Earth. Apart from his shimmering smoothness, deception and otherworldly first touch, it's clear he is tactically used well at Real as the conduit for every single attack or counter. He tackles back -- enough to be a niusance -- but lurks on the upfield edge of the action when the opposing team has the ball, pouncing to good purpose in precisely the right position when the ball is stripped. This is a footballer; and you can see how his approach influences everyone else's first touch too. I'm getting a Zidane shirt. He is a cat. He's learned so much in Spain: patience and game sense, above all. These are not the same as improving the free kick or the crossing technique, although Beckham's trademarks are even more intact than when he played at Manchester United. His real gift is delivering a ball that you can do something with. When Ronaldo called him 'a Brasilian,' that was when he had just arrived at Real Madrid. Beckham, now, is a player who makes everyone else more potent and provides to the aggregate a sense of rhythm as well as confidence off the ball. It makes the whole a lot more dangerous. Accordingly, you can't put a value on his importance to England's possibilities in Germany next summer. But let me drive the point by helping you imagine what it's like to defend against the recent England team. The middle four are scary. Beckham, Gerrard, Lampard, Joe Cole: each can hurt you in different ways. Beckham will go down the line four times and then, when you take that away, he'll cut inside and hold the ball up, allowing Gerrard and Lampard -- either or both at intervals -- to crash into the middle. If you give Beckham the outside, he will simply lay benders onto the forehead or boot of Owen and Heskey, Owen and Crouch, Owen and Vassell, Owen and Defoe -- it hardly matters which pairing. The only way to stop this is to stop Beckham from playing; and then you have to contend with Joe Cole who's usually feeling dangerous and will run at you from the left. That's England's DEFENSE. What about their OFFENSE? Neville (or my preference, Carragher), Campbell, Terry and Ashley Cole. They just don't give anything away, and when you're not keeping the ball against them they will join in with the other Frightening Four -- especially Ashley, who has a way of keeping a whole left side occupied. That's on his own: double Coles down the left is surely treble work for a defending team. This often leaves St. David on the right unmolested. From the opponent's point of view, defending against England is like herding cheetahs from a bicycle. I didn't even need to mention the intelligent speed of Micheal Owen which just lingers there, a constant threat, and creates gaps which Lampard or the DoubleColes will not shrink from exploiting. The only perceptible weakness in England is their English reserve, and an unlucky perhaps Scandinavian habit of playing tense; certainly not a lack of heart. If Mr. Ericsson can do anything else this year he can work on strengthening their winning mentality, help them relax and visualize coming back late from 1-nil or 2-1 down or visualize coping with a negative opponent -- of which there will be many. The big ingredient Beckham provides in this context is confidence. The confidence to mix up the pace, to probe dangerously even while slowing down, and he possesses and grants others the license do surprising things -- like permitting Joe Cole to attack at odds from the right flank instead. It should be clear that England is a more interesting as well as potent team under Beckham's captaincy. The only question remains how well they bear our high expectations. The thing about David Beckham -- and it's easy to forget this -- is that he's an awfully good footballer...who's still getting better. (*) Rumoured to be moving to Liverpool, the dark & handsome 32-year old Figo was 2001 FIFA Player of the Year for Barcelona & Portugal. He will do no harm in this experienced and still-hungry side. If Mr. Benitez figures out the English game, they will be thinking foremost about the Premiership Title in 2005-2006. No one influenced more than Gravesen for Everton. The Dane must relish the quality around him at Real Madrid and enjoy filling Claude Makelele's old boots. He will keep improving at the Bernabeu, and fills a critical role in that attacking side. They are lucky to have him.